I received news about the passing of a fellow colleague. 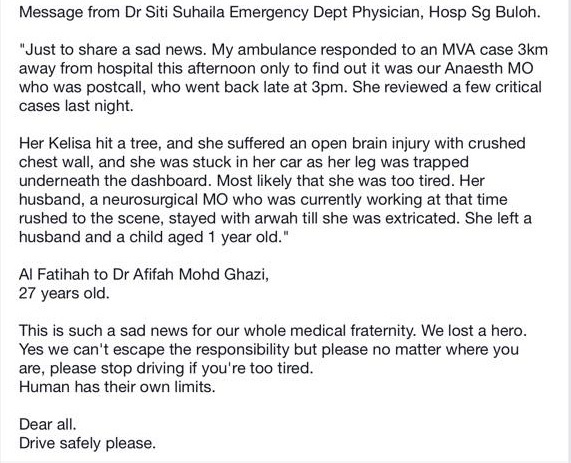 Dr Afifah Mohd Ghazi, a anesthetic medical officer from Hospital Sungai Buloh, was killed when her car crashed into a tree. She was driving back home after a night of on call work at the hospital. It was presumed that she was too tired to drive back home at the time. Her husband, a neurosurgical MO managed to rush to the seen to be by her side until she was extracted out from the wreck. 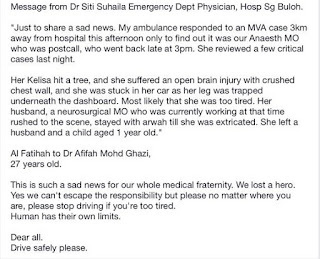 Dr Afifah Mohd Ghazi leaves behind her husband and a year old child. May her soul be duly rewarded in the Hereafter for her efforts and sacrifices during her line of duty. If anyone has any information on the schedule of her Solat Jenazah or how others can contribute to the family, please share at the comment section or in my Facebook page. To all doctors out there please be careful when you get back from work. If you are too tired, do take a rest before you drive off. Take care of yourselves. Salam Takziah. Semoga rohnya ditempatkan di kalangan orang2 yang beriman. Semoga Allah mencucuri rahmat ke ats rohnya.. Amin..